You are currently browsing fcorea’s articles. Perugia, October 29 014 -Umbria is one of the Italian regions with the highest incidence of immigrants (+ 8.1% compared to the national average and 11.1% of the residents), mainly women (56%). But the region lies with a higher than the national average even for newborns (15.1%, 19.6% of births) and the presence of foreign students (almost 14,000 students, 14% of the total ), of which about 55% were born in Italy (the national average is 51.7%). Lower than the national average is instead given the Umbrian regarding the acquisition of Italian citizenship. And ‘what emerges from the “Statistical Report on Immigration 2014” in the chapter on Umbria, edited by Bigi and Francescaglia. The dossier, sponsored by the National Office Against Racial Discrimination, refers to 2013. 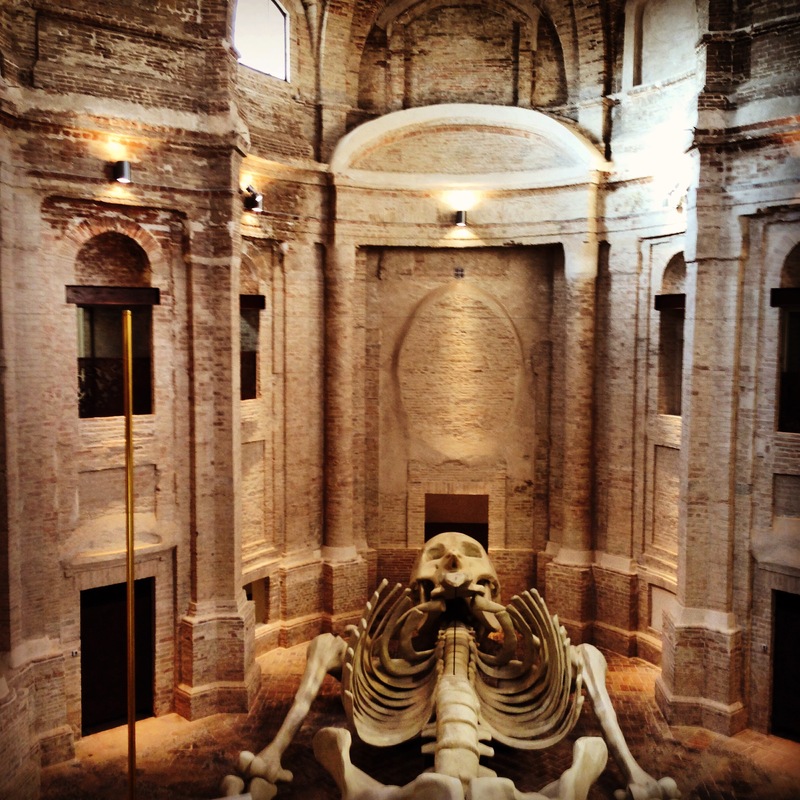 Last year – according to the Report – foreigners living in Umbria were 99,922, of which 76,861 in the province of Perugia (which represent 11.6% of the local population) and 23,061 in the province of Terni (10.0%). Non-EU citizens residing legally is 68,715, of which 41,115 have allowed a long period (there were 37,845 at the end of 2012), while the rest has a permit to expire. Faced with a numerical presence of residents remained almost stable between 2012 and 2013, the proportion of domestic permits expire (decreased by about 3,000 units a year) and long-term permits (increased by almost 3,300) has changed considerably favor of the latter. This is explained on the one hand with the economic crisis has dampened growth of the flows, as confirmed by the decrease in the number of permits issued for the first time during the year (only in the province of Perugia’s been – according to data from the police headquarters – from 21,178 in 2012 to 19,650 in 2013, with a particular decrease of those for work: from about 15 thousand to just under 11,000), and the other with the search for a stabilization for himself and his family, as also indicates number of family reunification (13,300). Among the non-EU nationality represented more priority needs still Albania (16,209), followed by Morocco (10 928) and Ukraine (5,154). Among the EU, with about 23,113 residents, is Romania that confirmed its first place Umbria recording a new annual increase (they were 21,051 in 2012) after the peak reached in 2011 (24,321). About 7,375 newborns in Umbria in 2013, while foreign (1,444, of which 1,156 in the province of Perugia and 288 in the province of Terni) accounted for 19.6% of the total with a figure above the national average (15.1% ). Are, finally, the acquisition of Italian citizenship 1,518 (1,174 in Perugia and 344 in Terni), averaging 15.8 per 1,000 foreign residents (the national average is 21.6 per thousand). Over time, the socio-economic characteristics of the region have made Umbria very attractive for migrants, but with the economic crisis, the labor market has changed in Umbria, especially hard hit the component of male workforce (both Italian and foreign) . In 2013 new hires were down for immigrants (-1.3%) as they recovered slightly to Italians (0.7%) and unemployment is also increased more for foreigners than for natives (the rate of immigrants stood at 20.7%, nearly 12 points higher than that of Italian, 8.5%), so that foreigners now account for nearly a third of the unemployed. In 2013, for those born abroad, the balance between hiring and termination of employment was negative (surplus of discontinued) to 2,942 units, with the exception of the agricultural sector, with a particularly steep decline for the industry (-6 , 4%). Unlike the male presence of foreign women workers has continued to grow and, unlike a few years ago, in 2012 was much higher (17.1%) than men (11.8%). In Umbria, 12.2% of foreign-born is active in agriculture (against an overall average of 2.9%) and 35% in industry (28%), while “only” 48.2% in the tertiary (69.1%). The foreign workers for 57.5% are employed in community services and personal services, to 30% in the hotel business and catering. Among men o ver a third (33.6%) work in construction, 24.1% in agriculture and a fifth in the tourist-hotel sector. As many as 71% of foreign-born workers are employed in micro businesses (1-9 employees), 47% in unskilled occupations (as in growth compared to the past), with lower wages on average by 30% compared to the Italians and monthly salaries that, as a result of the crisis, they have fallen more than those of the Italians (-8.4 percentage points versus -6.2). Among the 15 most numerous nationalities of Umbria, the Chinese have the highest employment rate (68%); a rate still above 50% is held by the Tunisian authorities, Romanian, Macedonian, Moldovan and Indian, while a rate below 40% characterizes the Moroccan community, Ecuador and Nigeria. Umbria firms immigrants are 7.8% of the total (national average 8.2%), with a positive balance between those initiated and closed during the year (+271 units, or + 3.3%; the the national average is 4.1%) and in contrast with the Italian companies (-1.4%), mainly in construction (31%) and trade (30%). Holders of individual firms (representing 80.4% of all those immigrants) come mostly from Morocco, Romania, Albania and China. And ‘the Romanian community to have sent more remittances to their country (21.6 million euro, 32.9% of the total amount left for other countries from the region: 65.7 million euro), followed by Moroccans ( 4.3 million), Albania (3.5 million), Ecuador (3 million). With regard to the students of foreign origin, who in Umbria an incidence greater than 9.0% of the national average, the data confirm the strong presence of the second generation, with peak incidence in the nursery and primary schools (a trend confirmed in the last 4 years). Especially foreign students 3,645 are in pre-school (where they account for 15.3%, of which 89% were born in Italy); 5,781 in the primary (incidence of 14.8% to 71.1% were born in Italy); 3,637 in the secondary level (15.5%, of which 41.0% was born in Italy and 4,278 in the secondary level (11.6% to 15.6% were born in Italy). 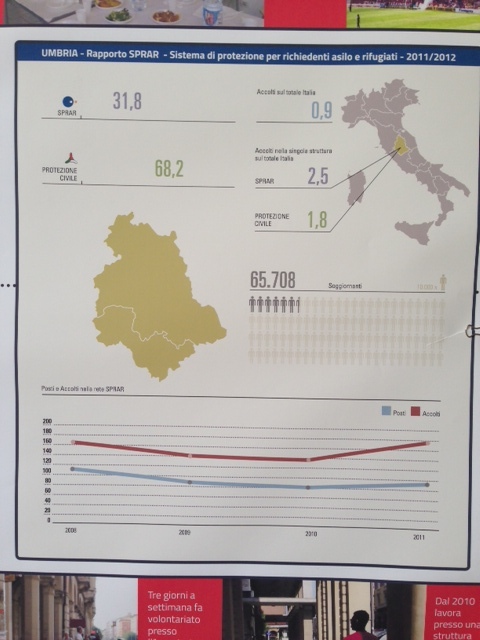 As for the address chosen in high school: 24.8% attended a high school (since an increase compared to previous years, which amounted to 34.8% in the province of Terni, against a national average of 20.4%), while the the vast majority has been moving towards a vocational school (36.6%, with a peak of 37.5% in the province of Perugia) or technical. The foreign students from Europe (10,575) account for 61.0% of the total and including stand Albanians (3,877), Romanians (3,609) and Macedonian (967). The Africans (3,884), mainly from Morocco (2447), Tunisia (281) and Algeria, accounting for 22.4% of the total, from the American 9% and Asia 7.5% of the total. 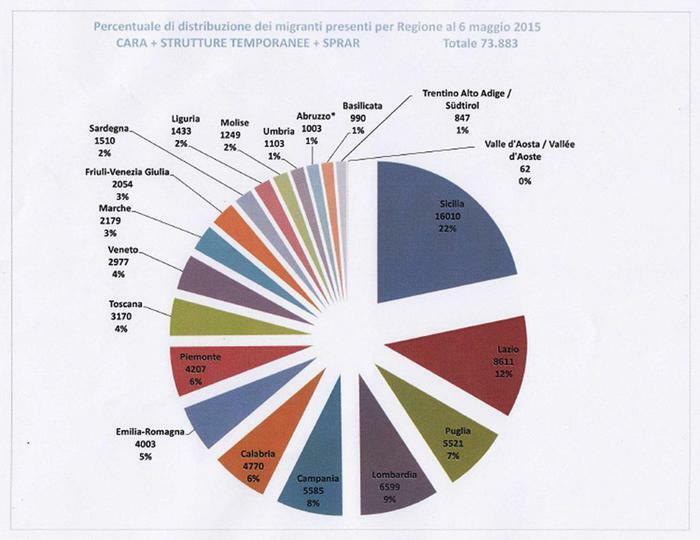 A third of migrants received in Italy, excluding minors, is distributed in two regions: Sicily and Lazio, which host respectively 22% and 12% of the 73,883 total. The Veneto, however, is among the major regions of the North hosting fewer people, with 4%, while those with less migrants is the Valle d’Aosta, which is home to only 62, 0%. The percentage is calculated based on the relationship between immigrants and population. 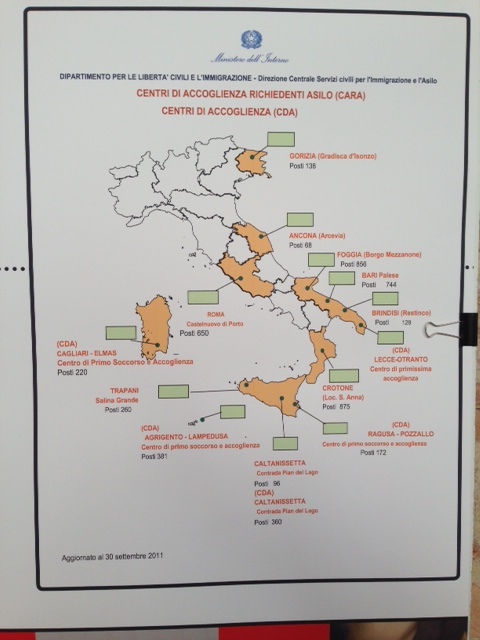 The data is updated to May 6 and is contained in a table of the Interior Ministry where there is a breakdown by region of migrants in Cara centers for asylum seekers, in Sprar, the reception system for refugees, and temporary structures . Hundreds of migrants have drowned in the Mediterranean this month, amid a surge in overcrowded boats heading for Europe from Libya. The flow of desperate migrants from North Africa hoping to reach Europe is already much higher than in the same period last year. Italy is on the frontline and has urged its EU partners to do more to help. At an emergency summit on 23 April EU leaders pledged to beef up the bloc’s maritime patrols in the Mediterranean, disrupt people trafficking networks and capture and destroy boats before migrants board them. However, any military action would have to conform with international law. The chaos in war-torn Libya remains a huge problem. Championing the rights of poor migrants is difficult as the economic climate is still gloomy, many Europeans are unemployed and wary of foreign workers, and EU countries are divided over how to share the refugee burden. 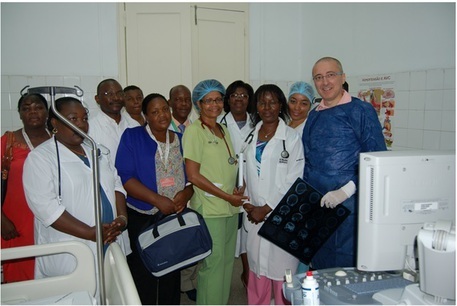 It also been realized with the support of the Ars, an association committed to support research on stroke, the stroke unit Josina Machel Hospital in Luanda, Angola. Dr. Maurizio Paciaroni, vascular medicine hospital in Perugia, he led the creation of the department in place that has three beds, two for monitoring of vital signs. The promoter scientific Ars is Dr. Valeria Case, president of the European storke organization. 10 exhibition areas, more than 170 booths and more than 200 free events including cultural events, seminars, demonstrations and workshops. 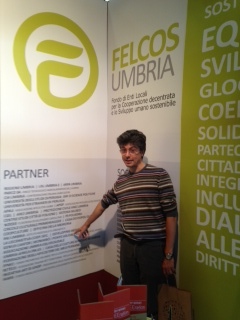 And then a program of initiatives developed specifically for schools, and at the center of the exhibition market green with sustainable companies in central Italy (and not only). 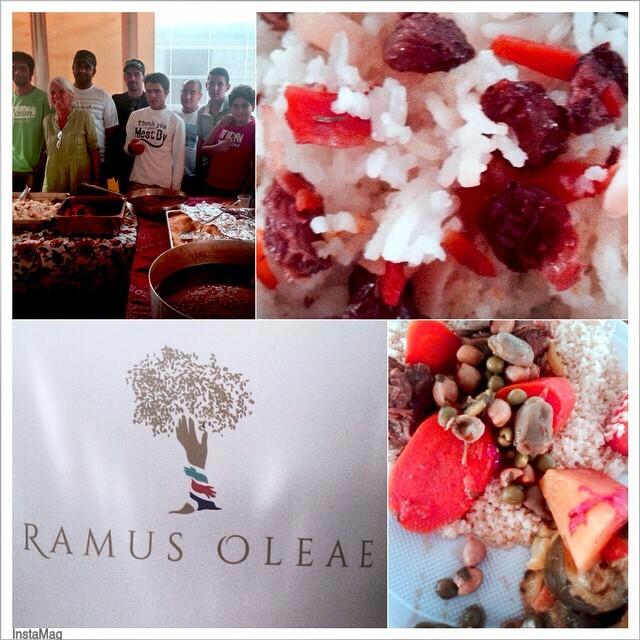 The Association Ramus Oleae administered by immigrants for immigrants, a partner of small farmers, volunteers and organizations, offers them the opportunity to acquire the skills necessary for a successful integration in the area of Perugia. A series of programs will give support to refugees who would otherwise be without a job and marginalized by society. In addition, the organization plans to launch a social brand of olive oil, certified as organic and DOP. The programs listed above can be financed with the help of collateral, sponsorships from companies and individual donations. In partnership with family-owned farms in the nature reserve of Lake Trasimeno, we hope to restore and give back to the production multitude of abandoned olive trees in the area. 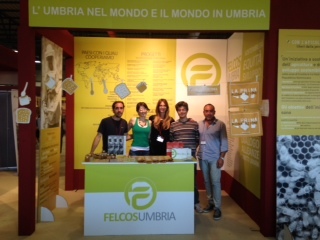 By doing this, we will try to give a new life to the production of crafts, the local economy, heritage and landscape. Developing a sustainable model, educational and economic non-governmental, easily repeatable throughout the country, Ramus Oleae aims to reduce racism and to increase solidarity between refugees and the native Italian population. The World Health Organization (WHO) has declared the spread of Ebola in West Africa an international health emergency.WHO officials said a coordinated international response was essential to stop and reverse the spread of the virus.The announcement came after experts convened a two-day emergency meeting in Switzerland.So far more than 930 people have died from Ebola in West Africa this year.The United Nations health agency said the outbreak was an “extraordinary event”.”The possible consequences of further international spread are particularly serious in view of the virulence of the virus, the intensive community and health facility transmission patterns, and the weak health systems in the currently affected and most at-risk countries,” it said in a statement.TAG:WHO: Ebola ‘an international emergency’Ebola outbreak in West Africa global emergency – CNN.comWHO declares Ebola outbreak an international public health ..WHO declares Ebola epidemic a global emergency – YahoWHO: Ebola an international health emergency | News24Ebola outbreak ‘international public health emergency’Ebola epidemic international health emergency – ITV.comEbola Outbreak Is International Public Health EmergencyWHO: Ebola Is Now An International Health Emergency ..WHO: Ebola outbreak is an international health emergency …BBC News – WHO: Ebola ‘an international emergency’Ebola is international health emergency – WMUR.comWHO: Ebola Outbreak is a Public Health EmergencyWHO: Ebola an international health emergency – Al ArabiWHO says Ebola outbreak is public health emergencyWHO: Ebola outbreak in West Africa is an international ..Ebola Outbreak 2014: WHO Could Declare Emergency of …Ebola Outbreak ‘International Public Health Emergency’Expert Panel to Consult on Ebola – NYTimes.comWHO starts emergency talks on Ebola – BBC.comSearch ResultsEbola outbreak now international emergency: WHOWHO declares Ebola epidemic an international health …Ebola: UN health agency to convene emergency meeting on Ebola crisis: WHO decides whether to declare international …Ebola an ‘international health emergency’ – Al JazeeraWorld Health Organization Says Ebola Outbreak “Wasn’t ..WHO: Ebola outbreak is a public health emergencyWHO: Ebola outbreak is a public health emergency …WHO | Ebola virus disease update – West AfricaWhat Happens if the WHO Declares Ebola an ‘Emergency of .WHO: Ebola Is Now An International Health Emergency .Ebola outbreak is a public health emergency – Wfie.comWHO: Ebola outbreak is a public health emergency – NewsEbola an international health emergency – Euro Asia NewsWHO declares Ebola epidemic an international healthEbola outbreak is a public health emergency – WSFA 12 NewsEbola outbreak is a public health emergency – The Fresno BeeEbola outbreak is international public health emergencyEbola outbreak is a public health emergency – WNCN.comEbola outbreak is a public health emergency – Times UnionEbola Outbreak Is a Public Health Emergency – 6ABC.comWHO: Ebola outbreak is a public health emergency – KPTV ..Ebola ‘an international emergency’ | Stuff.co.nzWHO: Ebola outbreak is a public health emergency – World ..Ebola outbreak is a public health emergency – The TribuneWHO: Ebola outbreak is a public health emergency – WBRCEbola outbreak is a public health emergency.